A while back Mark Lebedew tweaked some comments from legendary football coach Bill Walsh. He turned them into a post about the characteristics of the ideal setter. It reminded me of an experience I had a few years prior. I was watching a college football bowl game (2010 Sun Bowl, I believe). Hall of Fame NFL quarterback Bob Griese was the analyst. He made a comment that really bothered me. He called the football quarterback the only position in sports where the individual coordinates, plays, and leads their team. Compared to the volleyball setter, the football quarterback has it easy. Granted, setters don’t usually have to deal with 300lb defenders trying to smash them. They do sometimes, however, to have to contend with big goon middles who won’t get out of the way! Put the risk of a pile of big, sweaty guys burying you aside and consider these points. Setters often must chase the ball down. Quarterbacks get it placed basically right in their hands. The quarterback only runs one offensive play at a time. 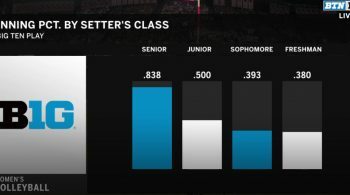 The setter often runs multiple plays in a single rally. A quarterback rarely plays defense, while a setter plays it constantly. Most quarterbacks get their plays called into them from the coach. Setters often call their own plays. Setters often have to improvise on the fly, while quarterbacks usually get to run the play they called. Setters are also leaders, of course. Football and volleyball are very similar sports (even Brett Favre says so). Maybe we should use that to help elevate the profile of the sport – at least in the US where football is king. 19 replies to "Hail the Setter!" I know of women’s coaches who call all the offensive plays… Axel Buring at Munster. He once said to me that the offence is far too important to leave in the hands of the setter. I am pretty sure that Liskeyvich did it with the US women’s NT in the 90’s. Once many years ago we toyed with the idea of of scripting the first part of the match… a la Bill Walsh. I have actually been thinking of variations of that again just recently. Less rigid than Walsh, but following the principles that drove his development of it. Do you have a link to the indicated source by Bill Walsh, Mark? Very true Oliver. Football having nearly twice as many moving parts and a broader plane in which to work – both width and lengthwise – means considerably more options and thus a way bigger, more complex playbook. On the subject of coach play-calling, it used to be that QBs called the plays themselves, but that’s less the case now with the exception of so-called audibles. As a coach who puts player development high on the priority list, one of the things that bothers me in the collegiate game is when I see the whole team turn to the sidelines to get the play call once they’ve line-up – basically a coach audible. We’re trying to teach these players decision-making, but then taking all the decisions out of their hands. But I digress. In terms of volleyball play calling, there can definitely be a degree of that. 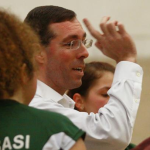 A coach can call the serve receive play and designate a primary free ball and/or transition play. One year when I was at Brown we devised a 2-digit play calling system with one digit for the MB and one for the OH and the OPP’s set based on what the MB was running. Mainly it was used by the setter pre-serve, but sometimes we would specify a play from the bench, which was part of the motivation for doing it. You couldn’t do that on the fly during play, though. I’ve actually on occasion compared the setter to the quarterback in an option offense. When running a multi-tempo attack, they’re job is to read what the block is committing on and pick the appropriate attacker. Yes, these audibles from the coaches when all eleven players look to the side line, the offense line on their knees looks funny. I still think that a setter could change a play by calling a signal for it, when the situation requires it during a play. But when talking about play calling in volleyball I’m first of all thinking of calling defensive plays. If we have a sufficient scouting before and during the game, coaches could call defensive plays that suit best to the up coming situation based on these reports. 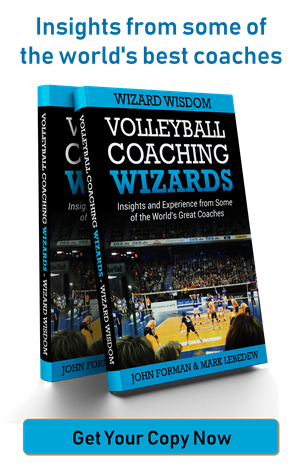 Given that in men’s volleyball a play in general is serve, pass, set, hit, play over – don’t you think that calling your defense to the most likely point of attack would over all increase the number of successful defensive plays? You would have to accept that some times there is no block at all because you called them to another point of attack, though. I think you will find that coaches do indeed call block/defense signals – at least at the upper levels. It may be that it just comes in the form of a reminder based on prior scouting discussions, but there is definitely that level of play-calling happening. Even at lower levels it can happen. With my players the last couple of years I’ve done things like telling them not to commit on the middle quick or whether to take a given hitter’s line or angle. That’s not a play-by-play call, though. It’s more meant as playing the percentages. Same with calling the floor defense. It’s not a play-by-play thing, but being in position for the most likely attack, adjusted by the player’s read of the play. When you say play-by-play do you mean from rally to rally, or even within rallies? I think especially on defense there have to be audibles for special situations occurring on the other side of the net. And I think those have to be called by the middle or libero, like they already do. If they can not handle it the coaches have to call the audibles. I think that the audibles have to be called by the players because they have the better vision/angle when the ball is in play. The problem with the play calling is from my point of the view that you have to us very complex signals (like in football when they raise different pictures. letters, numbers etc. OR use different signals every match, because your opponent will get behind those easy signals very soon. I watched a UCLA vs USC match last season (I think) during which the UCLA assistant coach was yelling Slide-2 whenever he saw a certain situation on the USC side of the net – meaning that was the play they were going to run off serve receive – presumably triggering a block/defense plan to deal with it. That obviously was based on scouting of a specific opponent tendency. It sounds like you’re thinking of something like the coach shouting “Blue” from the sideline while the play is going on and having that cause the block and/or defense to use a pre-planned scheme. My concern there would be transmission and receipt. Putting aside the lag between the coach evaluating and then transmitting the call, which is not inconsequential, there is the question of whether the player actually hears it and can process quickly enough. I am in the process of writing an article that compares setters with baseball catchers. I will provide a few ideas that compare the two sporting positions. 1. The catcher sees the whole game as he/she is the only player that has the game in front of them. This means the catcher moves the players around the field and directs where the plays need to be made. 2. Catchers deal with from 4-9 different pitchers. Each pitcher has a different personality, mental make up, strengths and weakness in their skills, and how they deal with stressful situations. Catchers need to be able to keep each pitcher happy, productive, keep the pitcher focused when the pitcher’s performance is slipping. 3. Catchers know when to let the pitcher throw a pitch of their choosing (shaking off the sign) and when to insist that the pitcher throws the pitcher the catcher calls. 4. Catchers come out to the pitcher’s mound to converse to the pitcher when things are not going well. The catcher needs to remember the ways that each pitcher deals with stress and adversity. 5. The catcher, pitcher, and manager (coach) go through the plan on how to pitch to each opposing hitter for that particular game (game plan) and looks for input from the catcher. 6. The catcher is the closest player to the manager and the player that receives signals from the manager on what changes might need to be made during the game. 7. If the manager is going to make a pitching change then the catcher’s opinion is an important piece of information in the manager’s decision. 8. A catcher can help a setter by listening to any problems a setter may have; because their roles are similar. The setter can be more honest with a classmate, fellow athlete, than with a coach. 9. Many of these comparisons apply to high school athletes as well as college athletes. I would appreciate any suggestions, or thoughts to ponder, regarding this post. Thank you. I am not a baseball expert. 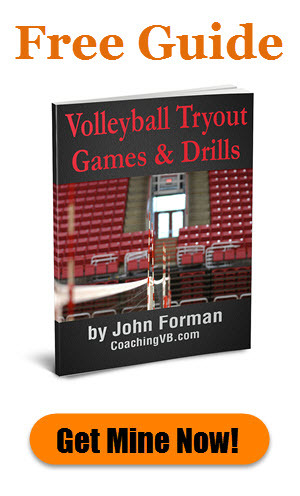 But what you wrote seems to apply to many positions in volleyball, not only the setter. Especially if it comes to moving players around on defense it’s the libero and middle who strike me first. I like the pitcher management aspect mentioned here as part of the role of a good setter is managing their hitters. I actually saw one of the best examples of this in the form of the Norwegian U17 girls’ national team setter at the 2013 NEVZA championships. Very impressive! My issue with the catcher comparison, though, is that in the end they don’t really make the final decision on play-calling. That is the pitcher’s call.